One aisle that we visit often when going to Target is the B.Toys section. B.Toys are always so colorful and the packaging inviting and perfect for gift giving. We have many of their products and just recently bought the Meowsic that has gotten a lot of slobber action on the microphone from Mason. 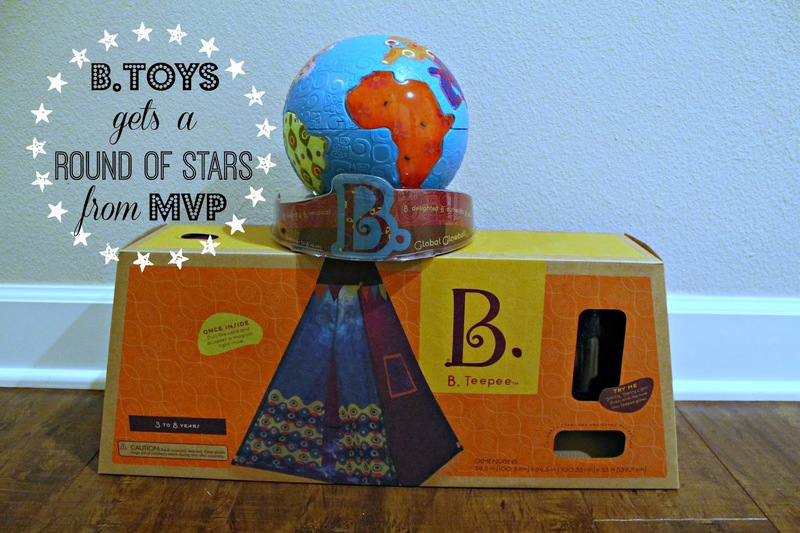 Since Kenzie has been into setting up makeshift forts with her chairs and aden+anais swaddles, I thought the B.Teepee would be a fantastic treat when it arrived for review. 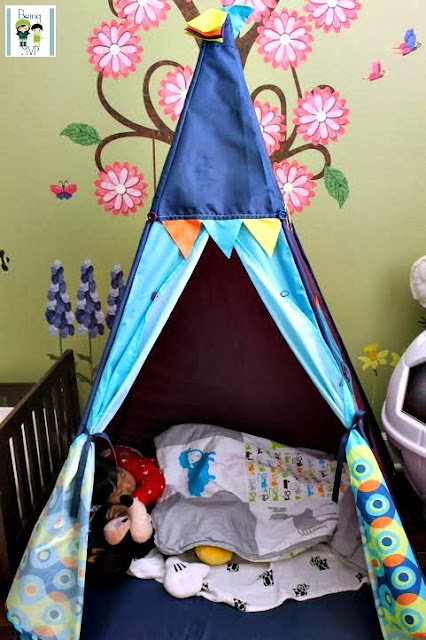 Teepees are super trendy nowadays and the B.Teepee is a fantastic gift for your tots this holiday season because not only is is beyond affordable ($35), it is the perfect size to fit in your child(ren)'s room. It was easy to set up as you just connect the poles and place through the slots on the teepee and then button the top onto the main frame and connect the magical light inside. I had it set up right after work in her room so when Kenzie came home with Hubs, she was surprised. She immediately gathered some blankets to take inside and set up shop. You can tie back the front panels to keep the teepee open for guests such as Mason who decided he wanted to tumble in and play. It's also a great place to take naps in! I really want my children to travel the world one day and will attempt to help them out on the first few stops. Europe or Alaskan cruise next year would be nice since we haven't gone on a proper vacation since Mason arrived. So when the B. 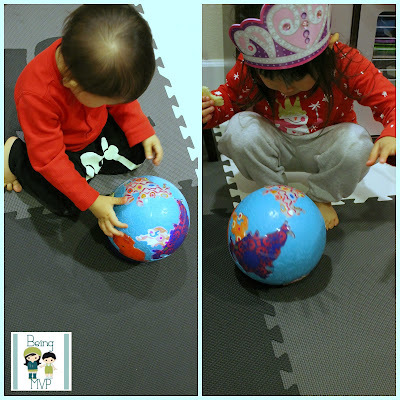 Global Glowball ($24.50) arrived for review, I was excited to show the kids the world. This is a fantastic first globe for children because not only does it show the different continents, you can opt to have the lights and music play at the same time or just the lights. There are 39 songs that play with their respective continents when you press. Mason LOVES this. He hauls around the globe and starts dancing. Any B.Toy you pick up this holiday season will light up your child(ren)'s face when opening on Christmas morning. They are well made as well as unique. Make sure to connect with B.Toys on Twitter! Their toys are my favorite! I want to get my son the one that has all the instruments for Christmas! That teepee is so neat! My grandson would think it's so cool and probably wouldn't ever want to come out! i never heard of this brand i love the teepee my daughter has been forming teepees with her blankets too! this would be great! i love target and i love the globe ball! that must be so cool for the light and music display! I find BToys unique and interesting. They seem to have a bold color scheme, which I like better than the bright colored toys. I love the Piccolo Bells and Magnetic Alphabetic.